Engineers at CERN have announced that the Large Hadron Collider, the machine set to kill us all, destroy the Earth and, most shockingly of all, ruin the final of Strictly Come Dancing has had a SF40m security update. Many believe that the LHC (which is the English acronym for the machine’s full French title of SKYNET) is capable of generating a black hole which would severely disrupt voting during the X-Factor. SKYNET has been rumoured to be housed at CERN’s underground lair on the Franco-Swiss border with the 27km super-gun circling a huge underground tank containing at least three genetically engineered shark-crocodile-Katie-Price fembots. 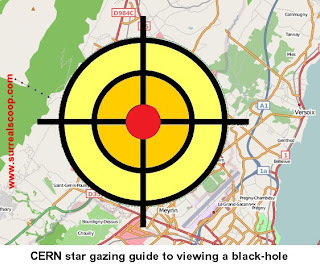 CERN’s announcement of the new warning system was contained in a press release carved into the forehead of an official from the Polish embassy found floating face down in Lake Geneva. This new system will ensure that there is no repeat of November 2008’s forced shut down of the collider, when a black-silhouetted figure was seen hastily working on an elaborate electrical wiring loom as a large clock counted down nearby. The British Secret Service, MI6, said that the new warning system may represent an end to the chances of saving humanity, unless someone is willing to carpool.